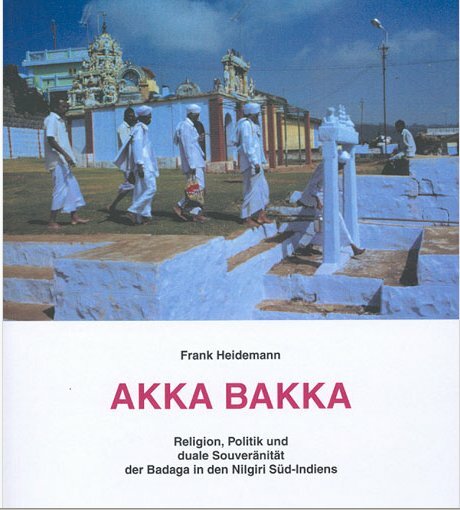 Of the many scholars who have done extensive research on ‘BADAGA’, Prof.Frank Heidemann, an anthropologist, of Munich University, Germany should be one of the figures at the top. He has been associated with his research of and on Badagas from 1984 onwards. His biggest advantage is that he has been to the Nilgiris on a regular basis and chosen Kotagiri – specially Jakkarai, as his ‘headquarters’ that has helped him to understand the Badaga way of life much better. 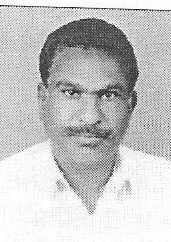 He has written a book on “Akka Bakka ” – see the page on ‘research’ and many papers including the one on ” ‘The Priest and Village Headman : Dual Sovereignty in the Nilgiri Hills ” describing the relationship between a Gowda [Gouvundikkay]- the village headman and the village temple priest – Hatti Gudi poojari [based on his observations in Jakkanarai. 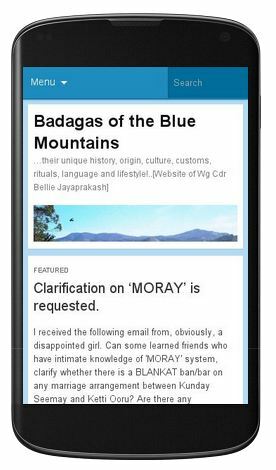 This research will explore the music and poetry unique to the Badaga community of the Nilgiri Hills (also know as the Blue Mountains), South India. The Badaga community is the largest of the indigenous communities of the Nilgiri Hills, their population estimated at around 150,000 today, spread out among around 370 hamlets and villages called Hatti. They are agriculturalists and cattle farmers. Traditionally a chiefdom, they comprise a group of six main clans (phratries), sometimes incorrectly referred to as subcastes. These are organized hierarchically, still today headed by a village headman. This social structure is characteristic of a tribal community, yet they are classified by the government as a “Backward Caste,” and therefore situated at the lower end of social ranking in India. There is an ongoing battle to become officially recognized as a “Scheduled Tribe,” partly for economic reasons, partly to benefit in social ranking, and partly to gain cultural capital. Despite this campaign, however, the community is actively and consciously integrating itself into the larger community through, among other things, emphasizing the importance of education and developing high standards of agriculture and commerce. In this respect, they do not want to be left behind in a rapidly modernizing world by adopting the stereotypical traits of an isolated community classified as “tribe.” It will therefore be interesting to examine the ways in which tradition and the idea of “tribe,” which are particularly important to the Badagas in establishing a sense of community, can survive and be recast in order to help the Badagas establish their place in society, rather than hinder their development as an advancing community in India. My ethnography of the various artistic forms of cultural life in a Badaga village will include an investigation into the role of music and poetry, among other aspects of the creative process, in constructing and maintaining personal, ethnic and community identity. In particular, I will examine the genre of oral “epic performance,” kade (lit. “song”), and the ways in which these performances communicate ideas of “Badaganess” by serving as part of an ensemble of cultural symbols that articulate personal, ethnic, and community identity within both the Nilgiri Hills and contemporary Indian society at large. In recent years, a growing cassette culture has emerged from the Badaga community, where epic tales are recorded as well as “spiced up” with elements of Tamil film music. In pursuing these themes, I explore the extent to which this genre, in all its forms and performance contexts, embodies notions of territory and recapitulates and preserves personal, historical and communal memory within a modern context. Implicit in these themes are pertinent issues of globalization, cassette culture, the “invention of tradition,” the idea of the “tribe” in India, and the dynamic, flexible nature of a small, indigenous community in contemporary India. By situating Badaga culture within contemporary Indian society, and by addressing the complexity of small-scale communities through acknowledging the agency of the individual in experiencing, defining, and interpreting cultural symbols, I will explore the symbolic and political importance song plays within these communities. I plan also to examine the extent to which both Badaga social and personal memory is encoded in the creative aspects of this performance tradition, such as storytelling, behavior, gestures, music, song, audience-performer relationship and interaction, and performance style and context, and the ways in which these meanings are embodied as part of everyday practice (Bourdieu 1977). Through this dialectic of text and practice, I hope to illustrate how Badaga culture, and indigenous culture at large, is a complex ensemble of interrelated phenomena that cannot be separated or reduced. Furthermore, I propose to investigate how these elements enable the “invention of tradition” (Hobsbawm and Ranger 1983), and the ways in which people creatively invent, use and manipulate tradition and memory within not only historical but also contemporary contexts such as commercial cassette recordings and films. This analytical shift from text to process and practice (Honko 2000) will enable me to explore the strategies implicated in reinventing tradition and musical memories and the implications this has for a construction of Badaga identity. By acknowledging that identity is not confined to the political and the ideological, I will pay close attention to the affective and emotional aspects of oral epics in all contexts, and explore the ways in which listeners, performers, and consumers of the cassette industry identify with the music that ultimately contributes to an enlarged sense of self. 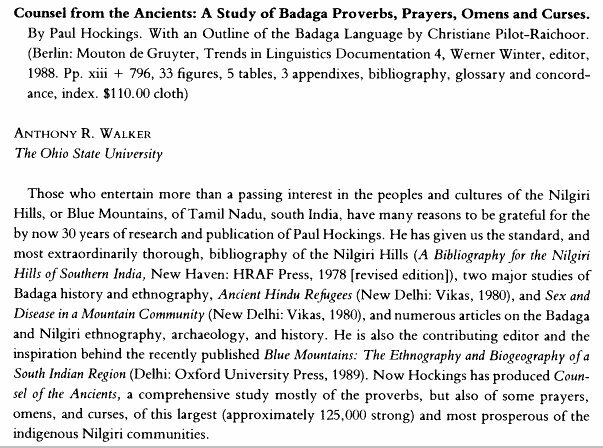 The scope of this study will broaden to include the social, cultural, and musical relationships between Badagas and their neighboring tribes, the influence of Western music and mainstream Tamil film music on Badaga performance practice, and the tensions inherent in Badaga society between establishing themselves as a “tribe” and asserting their cultural heritage within the Nilgiris region. By collecting, transcribing, and analyzing Badaga oral epic songs, both in live performance and from commercial recordings, I aim to explore the structural, musical, and emotional composition of the genre, and the ways in which music informs the improvised poetic narrative structure of “epic performance.” I will also investigate the extent to which Badaga society is enacted or represented in its ideal form in epic performance, and therefore becomes a means through which Badagas acquire their morals, norms, and values. In addition to this, I will study particular individuals and attempt to convey their experiences with listening to or participating in the performances. I will seek to identify how it affects them emotionally, what themes resonate with them and why, how the performances constitute part of their life-worlds, and how the songs relate to how it feels to be a Badaga today. 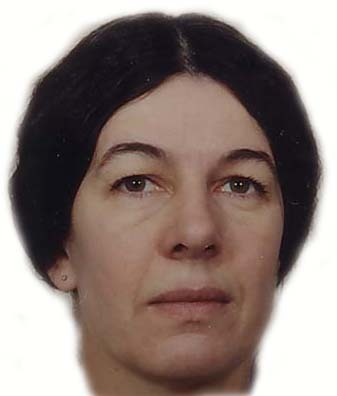 Pile-Raichoor, Christiane. 1991. 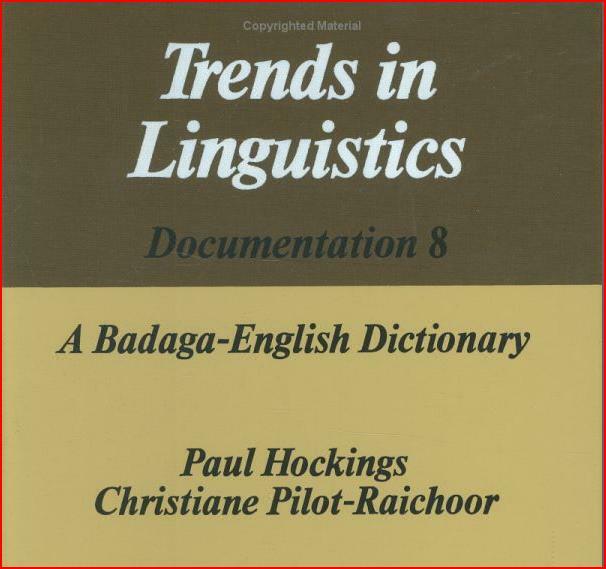 The badaga: language dravidienne (India). Description and analyzes. Thesis of doctorate, University of Paris III. Pile-Raichoor, Christiane & P. Hockings. 1992. Badaga-English Dictionary. New York/Amsterdam: Sheep of Gruyter. It is ironic that despite extensive research on them by western scholars, the Badagas are little known outside the Nilgiris. Even the vague perception swings widely from the Badagas being rich tea estate owners to one among the obscure tribes on the hills. The Badagas used to be called a tribe in the past but they are not one according to anthropologists, who prefer to call them a ‘community’. In any case, they are not a Scheduled Tribe or a Scheduled Caste. Interestingly, it was the Badagas themselves who refused to allow the community to be included under the Scheduled Tribes, along with the other tribes of the Nilgiris, when the commission empowered to identify such groups visited the Nilgiris in the 50s. However, of late economic compulsions have forced the Badagas to represent to the central government to include them under the Scheduled Tribes. Are the Badagas an affluent community? Yes and no. The Badagas own a substantial share of the tea plantations and estates in the Nilgiris, make up the bulk of the small tea growers, almost monopolise the professions of doctors, lawyers, engineers and teachers in the district and a growing number of them are in overseas employment. Yet, only the top 10% can be really called affluent. The next 50% are middle class and the rest 40% lead a subsistence living. Abject poverty never existed among the Badagas, thanks to their sharing and caring social system, but it is not uncommon now to see Badaga beggers in towns. Unlike the tribes like Todas, Kotas and Kurumbas, whose numbers never exceeded about a thousand, the Badagas are the largest social group in the Nilgiris. The British kept a count of them and the other tribes right from 1812 when there were only 2207 Badagas. At the turn of the century(1901) there were 34176 of them and by the 1971 census their numbers increased to 1,04,392. After that the Census data thoughtlessly clubbed the Badagas with Kannadigas leaving the population of Badagas to speculation. Considering the fact that there has been a spontaneous tendency towards small family norms among the present generation of Badagas, the safe guess for the Badaga numbers now would be about 150000 spread over some 370 hamlets. As a matter of fact, the Badagas can do a head count of their own in a matter of weeks but, as with many aspects of the community which cries out for collective initiative, no one seems to be bothered. Badagu, the language of the Badagas, was for long considered a dialect of Kannada. But a French Linguist has now established that it has gone through a process of individualization long enough to be recognised as a separate language. But there is no script. Tamil and English are chiefly used for writing and speaking. Yet another popular but needless controversy surrounding the Badagas is about their origin. Researchers say before they settled in the Nilgiris the homeland of the Badagas lay in the Mysore Plain to the north of the district. The very name Badaga, which in Kannada means ‘northener’ bears it out, they say. 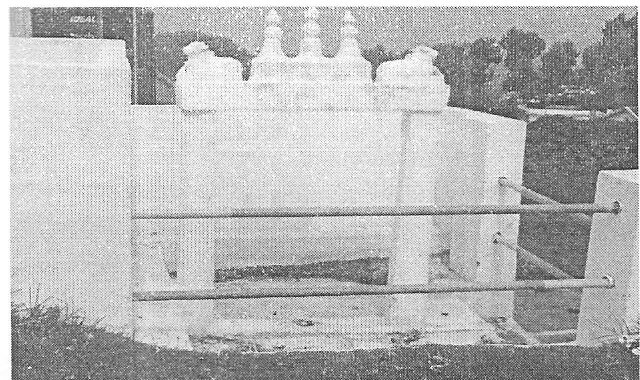 The Badagas themselves as well as the researchers believe the migration of the Badagas to the Nilgiri hills happened over several centuries starting mainly with the fall of the Vijayanagaram empire in 1565 at the hands of the Moslems to Tippu Sultan’s conquest of Mysore in the late 18th century. Local scholars however contend that the Badagas could not have evolved into a distinctive group unless a part of them have always been there in the hills. Evidence of a native population on the hills date from the first millennium AD or even beyond. Perhaps, archaeological evidence can settle the debate but they have long been buried under the tea, coffee and wattle plantations! And it is certainly not one of government’s priorities. The Badaga community comprises six major sub-groups. The Wodeas or the Lingayats who trace their origin to the Wodeyars of the royal house of Mysore. 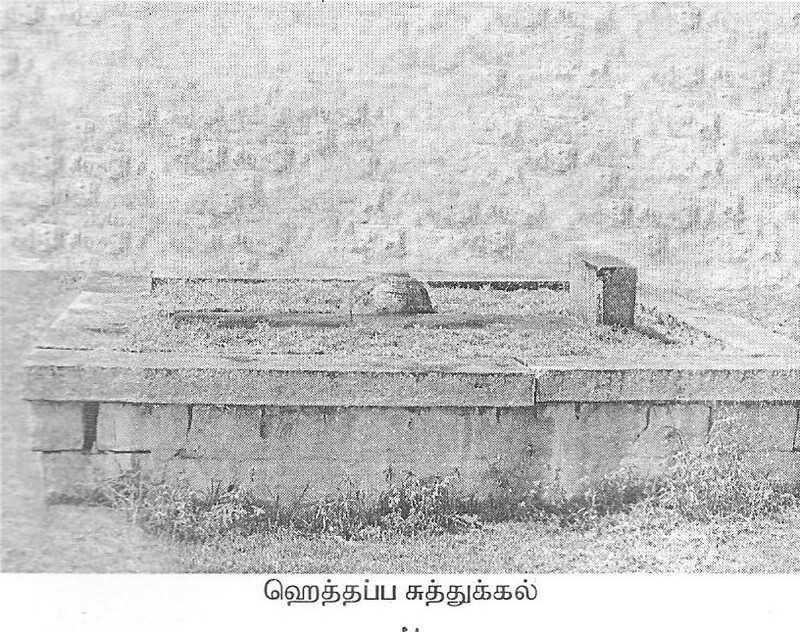 The Kongaru from the Kongu region in the plains. The Haruvas or the Brahmins. The Adikaris or the Magistrates. The Kanakkas or the account keepers. The Gaudas or the cultivators and the Toreas or service-providers. The Gaudas are the dominant group and generally suffix their names with ‘Gowder’. Though each group continues to preserve its identity there is hardly any social or cultural segregation among them. Most groups intermarry. Marriage with non-Badagas is rare but the number is rising in recent years as more and more Badaga youth leave the hills to seek employment outside. Except for the small number converts to Christianity, the Badagas are all mostly practicing Hindus but they have their own distinctive and unique social and cultural practices. The customs governing marriage, death etc are exclusive to them. The worship of Goddess Heththe(Ancestral Goddess) is unique to them. The Badaga villages and their houses too are unique. Some of the Badaga women, especially in villages, still wear distinctive dress. Badagas have a rich oral literature of history, stories, proverbs, prayers, ballads and songs. Badaga music and dance are captivating. 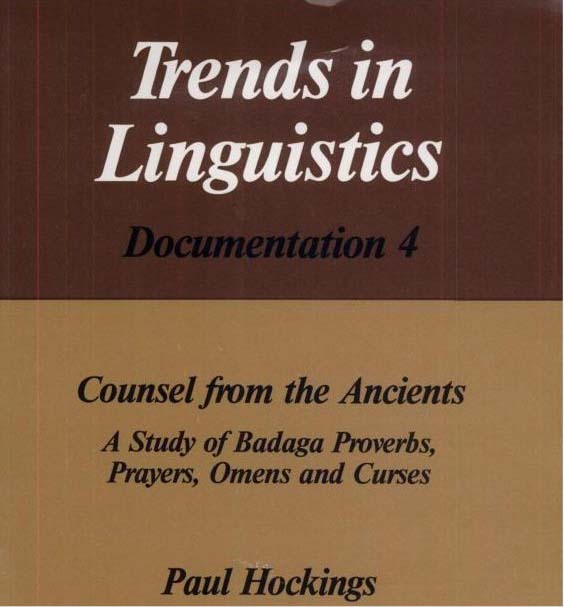 Prof. Paul Hockings has given a lot of Badaga Proverbs (Doddaru Shulokka) in his book. “This book focuses on the household of the Badagas, a community living in the Nilgiri Hills in southern India. 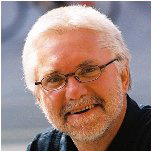 Paul Hockings reports his unique longitudinal study of this community, covering 27 years of measurement and socio-cultural change in four sample villages, where he conducted censuses every nine years. 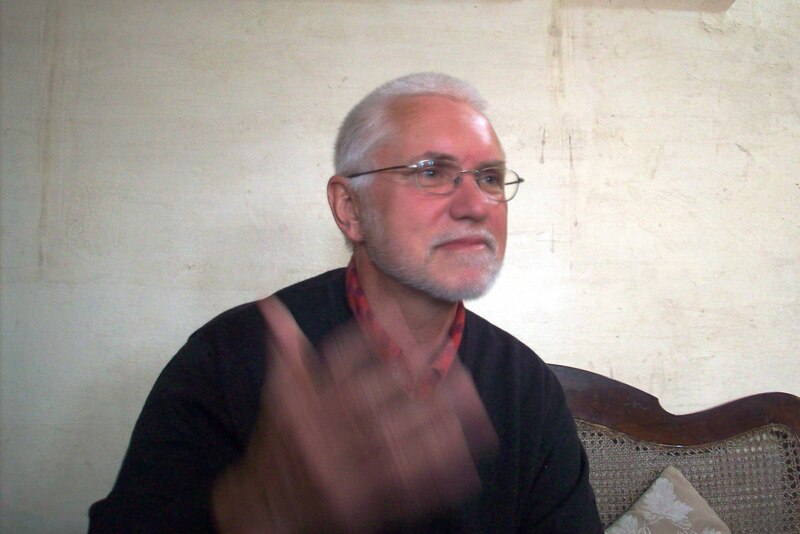 “Combining his knowledge of anthropology, history, demography and linguistics, the author focuses primarily on demographic transition and social change over time. He also studies kinship, marriage, household structure and various aspects of Badaga contemporary life including the influence of the mass media, schooling, their economy and migration. The overall purpose is to understand the nature of the process of modernization among them. “The most important conclusion that Paul Hockings reaches is that the Badagas, more specifically their womenfolk, have managed to cap any population explosion that was previously under way. Among his other findings are: that Badaga modernization has occurred without significant industralization; fertility has declined significantly during just one generation, largely as a consequence of changing attitudes towards children’s inherent worth; and that the easy availability of education has assisted the emergence of modernizing tendencies. As a manifestation of this, the Badagas are moving away from subsistence farming to tea plantations, from ascribed status to educated professions, and from self-sufficiency to urbanized ‘middle-class’ tastes and attitudes, in conclusion. Paul Hockings presents a general model for the modernization of Badaga economy and society. “ Paamé ” – The history and culture of the Badagas of the Nilgiris by B.Balasubramaniam, encompasses a comprehensive history of the Badaga Community and showcases to the world the unique aspects of Badaga history and culture and is a treasure trove in ethnology. Bala, who is known to me for the past many decades, told me in an exclusive chat that it took him two and a half years of research and labour to produce this book ‘Paame’ which he wanted to be as authentic as possible as far as the origin and history of the Badagas are concerned. Though, for practical purposes, he had to restrict the number of pages, he has material for another hundred pages which he may incorporate in the future editions. This book is published by Elkon Animations, Bangalore and is priced at Rs.295/- Incidentally, Elkon Animations is owned by another talented and great Badaga Engineer and my friend Yedapally Raju who, by the way, is a good friend of Infosys Narayanamurthy . You may buy this book from leading book stores located in M.G.Road, Bangalore or from the Publishers at Elkon Animations, 11 First Cross, Bhuvaneshwari Nagar, CV Raman Nagar, Bangalore – 560093.It is available at Higginbothams Ooty,Chennai and Coimbatore and also at Oxford book house, Coimbatore. I have gone through the book a couple of times and can say with confidence that this book will make every Badaga very proud to belong to this great and unique community. During the present visit to the Nilgiris (Jan,2010) I came across another book on Badaga byJakkanaarai SIVAJI RAMAN. The book is in Tamil and titled ‘படுக சமுதாயம் [Badaga Samudhayam]‘ – Badaga Community. It appears to be a private publication with a forward by Rev.Malli (Originally of Kerbetta Village). One of the most interesting information Sivaji Raman conveys in his book is that Badaga language finds extensive mention in old – purana – Tamil literature like ” Tholkaeppiam” where it is clearly mentioned that Badaga was a separate language spoken in a northernnation to Tamil nadu called ‘VADAGAM [Badaga]‘, the other ‘countries’ being Karnadagam [Kannada], Konganam [Konkani], Kudagam [Coorgi], Thuluvam [Thulu], Telingam [Telugu] and Kalingam [Oriya]. He goes on to quote a few verses where ‘vadaga’ is mentioned. He is of the opinion that Badaga can be traced back to 2300 years. ‘ படுக மொழி தற்பொழுது படிப்பு, தொழில் ஆகியவற்றில் தமிழ் மற்றும் ஆங்கில்லத்தின் தாக்கம் காரணமாக மிகவும் மாறுபட்டு பேசப்படுகிறது. 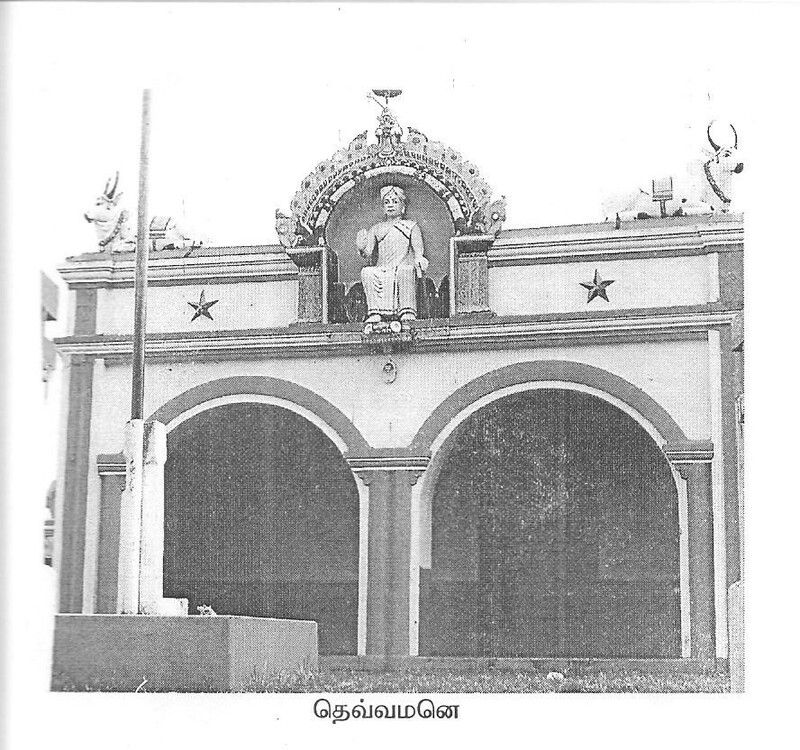 தூய படுகு தெரிந்தவர்களே இல்லை என்றாகிவிட்டது. இது படுக மொழியில் சொல் பஞ்ச்சத்தால் ஏற்பட்டதன்று. படுக மொழியின் ஏராளமான சொற்கள் மறக்கப்பட்டு மறைந்து விட்டன. இதற்கு காரணம் படுகு மொழிக்கு வரிவடிவம் இல்லாததேயாகும் ‘ ( Badaga is spoken very differently due to the influence by Tamil and English on education and profession. It appears that there are none who know ‘PURE’ Badaga. This is not due to lack of words in Badaga. Lot of Badaga words have been forgotten [due to the influence of Tamil and English] and hence become extinct. The reason for this is that BADAGA language DOES NOT HAVE A SCRIPT). 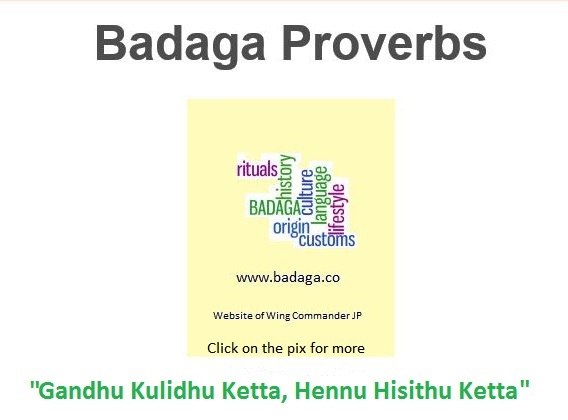 There is a lot of information on Badaga Habbas like ‘Dhodda Habba, Biththu Ikkuva Habba, Uppu Attuva Habba, Sakkalaaththi’ etc apart from a variety of topics on and of Badaga. Another laudable effort by a Badaga on Badaga. Very interesting book. Hope to write more on this book soon. When a village was [hatti] was formed, a ‘Hethappa [Ancestor] Kallu [Stone]‘ was created and then a ‘Devva Mane [God’s House – Temple]‘ was built. ‘Hebbaiyilu’ [First /Big Threshold]‘ is the entrance to a village [Akka Bakka?]. It consists of two vertical stone pillars with a central horizontal stone containing carvings. Hello JP sir, I am Kesavan, deputy registrar/ administrator of NCMS. I plan for an article about founder of our institution Honourable HB Ari Gowder and his contribution to cooperatives, this blog is very useful. I want to speak with you. JP sir, I am thanking you, I am really impressed with your blog. I would like to share some view with you because I am going to prepare a presentation on “BADAGA COMMUNITY”: initially, I got help from your site so far. I thank you once again, please keep it up. I have visited THANGADU VILLAGE , for understand the Culture and consumer behavior.They belong to a very sensitive culture ; their nature really heart touching (God gifted). I miss them a lot. Namaskkara.. I have got this video of interview with Paul Hockings, while surfing where he is mentioning about us (Badagas). This is just for your information. Its really interesting and happy to see some useful info about Badugas. Thanks for giving such a good reading. I am sure that this site will be a beginning for a long voyage. I wish all the best to site admin for further updates.And….my suggestion is to change the content with some standard font for easy reading. May God bless you with full of strength and freshness to continue this great work.